My name is John Cox and as my screen name says I live in Arizona. I never even imagined being an artist early in my life even though I loved to draw and art of all kinds, paintings, sculpture fascinated me for the time I was a little kid with crayons and a coloring book. But and artist? Not a boy from South Texas, interested in hotrods motorcycles, racing and girls, that is for sure! I grew up in the late 1940's and especially the 1950's. Back then we went to school and learned readin,' ritten,' and 'rithmatic. The three "r's as many called it. After school a few kid went to college, but a lot of us went in the service. So, in 1959, I went in the US Navy. The Navy does not lie in it's recruitment posters. I did see the world. I went around the world two and a half times in 5 years. I loved it and was going to make it a career, but I was wounded on Shore Patrol duty. I was fixed up and discharged in 1964. I had no idea what I was going to do since every thought had been focused to a Navy career. Well, while trying to figure things out I returned to what I knew before. Hotrods, motorcycles, and racing. I got into drag racing and within a year doing it at a professional level. I also began painting them doing custom work as a "day job" during the week. I also married, had a family and kept racing and painting race cars and motorcycles. I also did pin striping, lettering, gold leaf work. everything that went into completing a first class paint job on many famous race cars. In 1974 racing had changed dramatically and so had the costs. Corporate sponsors were coming in and there is a saying in racing that nothing goes faster than cubic money. I had a family to support and began thinking what I really wanted to do when I grew up. When not painting cars or driving as a substitute driver, I drew pictures to relax and think. A friend who was a very fine potter took several of my drawings and had them matted and took them to an art show he was in while I was out of town. Not only did he sell them, he met a gallery owners wife who gave him a card and told him to tell me to get in touch as soon as I returned. well this is getting way longer than I intended but suffice to say, that is how I became an "artist." Yesterday, I could not spell it, but today I are one. This began a scramble to learn what the hell am I doing! I talked to other artist at mall shows, I bought books, I drew and painted everything, everyday and for 10 to 12 hour a day. I went to museums, art galleries, shows, you name it. I did everything I could think of to learn. There was no real fine arts school where I lived or anywhere close, so it was books, help from other artists and lots of trial and error. more error than anything else. I had never heard of an art workshop, let alone look into taking one or two. There was no internet that had wonderful sites like this one. It was work. I was fortunate in that for whatever reason, I could see something and draw it. I had no clue what I was doing, really. That was 38 years ago. Since I have had the good fortune to meet and become friends with some of the finest artist working today. I came from car painting and racing into the world of art and showing in top galleries and teaching workshop and was a regular teacher at the Scottsdale School of Art until old injuries and health made that a little to much. 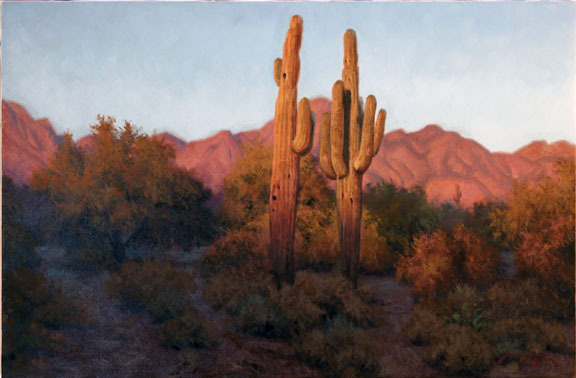 Now I live in the foothills north of Phoenix/Scottsdale and work in my studio. My son helps with crating and shipping, stretching linen for me. I'm only 71, but if I knew I was going to live this long, I would have taken better care of myself as the saying goes. Two heart attacks, asbestos in lungs, not to mention that my lungs must be candy apple of some color over mother of pearl, bad joints from arthritis and old injuries has made it so going out and painting in the desert or mountains has become out of the question for me. 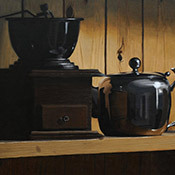 Consequently, I am shifting my subject matter more towards people and still lifes with an occasional landscape. I tell you all this because we can all work and learn by dedicating ourselves and working to achieve the best quality possible, be it art or whatever. Paint everyday and take classes, review Marks videos repeatedly and go for i. You will succeed. This is my other last painting of 2012. I hope you like it. I love it, John. It's a stunning work of art, and I am pleased to meet you Sir. He is a very fine artist.... simply love your painting.... and a warm welcome to the forum. ... you had a life full and busy, I'm younger than you, but even I can not complain, my life is complicated, and in this world where job is always less I have two! I must untangle from the daily grind but I dedicate all my free time to my true passion...painting! I've never wanted to hug cacti before... but I would hug those. Sweet painting. Thank Ya'll for the kind words. I appreciate it. I wanted to tell you a little about this painting. 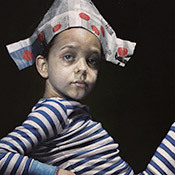 This painting is 16"x24" it is oil on oil primed linen, Claussens #13 double primed. My palette was Cadmium Yellow light, Alizarin Crimson, Burnt Umber, Ivory Black with Ultramarine blue mixtures in the sky and mountain shadows. The greens of the desert are more easily made with the black. When using black I think of it as a blue when mixing. You probably notice this is Marks palette with the exception of the black. This is the desert in North Scottsdale, Arizona, about 10 miles from my home. The mountains in the background are the McDowell Mountains that make up the eastern edge of Scottsdale. It will be framed in a custom made frame, probably from America West in Flagstaff, Arizona The time in this painting would be around 7- 7:30pm during the summer. I made a plein air painting of this scene about 10 years ago. I used the plein aire piece (8x12) and some photos I took in the same general area. The Sahuaros shown here are actually right off the side of Scottsdale Road at the entrance to an upscale housing development, I am sad to say. Its a beautiful painting. Is that your standard palette or does it vary from painting to painting? It is pretty much my standard palette that I use daily. Now I do shift on the chroma scale for some things. By that I mean instead of Cad. Yellow Light, I might use Cad. Lemon or Yellow ochre instead. I don't always use the Ivory Black but I might use Cobalt Blue Pure instead of Ultramarine blue in some landscapes. Skies here, particularly in red rock country the sky can almost be a blue green and the red in Ultramarine makes for a muddy look instead of the clear blue green. When painting people I may use Yellow Ochre, Cad Red Light and Ivory Black. Then for another person I may stay with Cad. Lemon, Alizarin and Ultramarine blue. It may seem like I am shifting around a lot, but not really. If you notice I have a yellow, a red, a brown, and a blue. Plus white, of course. Oh and for white, I use Utrecht Mixed white. It is Titanium and Zinc mixture. I use M. Graham's Walnut Oil to slow drying and oiling out if a passage gets to dry before I get back to it. I have some small paintings that are a huge departure in palette that I call my insurance policies. 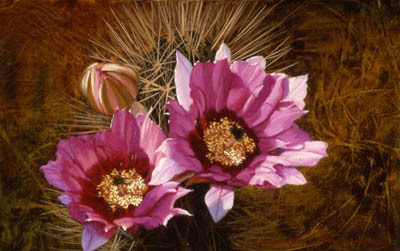 They are a couple of varieties of cactus blossoms They are usually 9x12 and 8x12 in size and done on a linen panel. The palette is Thalo Green, Transparent Oxide Red, Alizarin Crimson, Permanent Rose and Winsor Newton Magenta and a little Cad. Yellow light. They are pretty intense. I call them insurance policies because no matter what show I send one two I know I have a sale that will cover shipping costs and the cost of making the paintings for the show. They have sold from New York to Minnesota in the winter and of course here in Arizona. I number them now, I ran out of titles. Thank you so much for sharing your real name and a bit of info about yourself... I very much appreciate it. I'm so glad that you've joined DMP, considering your extensive experience and accomplishments in the art world. You have contributed so much since you've joined and I've enjoyed reading your comments. Thank you for sharing your knowledge and experience and your paintings. Looking forward to following your journey onwards. 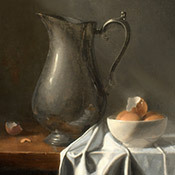 I checked out your website http://www.johncoxfineart.com. You've got a fantastic art collection there!!! I'm not really practice all self-taught but I noticed that the flower is another subject where I tend to overblend and for me they are difficult like tones skin. I really admire those who can do at this level! Really nice your cactus I love so much the colors are alive and the effect is natural! A wonderful journey John and one that has been justly rewarded by your beautiful work. Thanks for sharing....isn't it funny how "lucky" we get through hard work and persistence?! That is a lesson that also goes back to the days of the three "r's that flies in the face of today's mantra of "I want it all and I want it now!" Maria, this bio of mine was getting way to long, still is, but one of the things I want all to know is yes, I worked hard to learn about art. That being said, I would be less than truthful if I said I was totally self taught. Once I could afford it, and that was barely early on, I took workshops from artists I admired, but painted in a similar way to each other and what felt "right" when I was painting. Later I took workshops from artist I admired, but had a far different style. Many I became friends with simply from being in the same galleries or doing shows together or they lived nearby and I saw them regularly. Some of these artists taught me a lot privately when just having conversations at one of our homes. One I must mention and that is the late great James Reynolds. Jim, was a lousy teacher, most people thought. He was straight and direct speaking and told the truth as harsh as it might sound, but if one did not take it personally they could learn so much in a single hour or two with him. Many artists were afraid to having him critique their paintings, but there was a few of use who did want this. He would look at the piece for about 5 or so minutes without saying a word. Trust me, it was the longest 5 minutes I ever lived through. Then he would begin to start shredding the painting to pieces. Not a square inch was shown mercy. When finished he would pause and say, "But...." and then he would tell you everything you did right and how to correct the mistakes. By the time he finished you felt great and could not wait to get back to the studio and start fixing the painting. Jim was a big man, about 6'6" and tough as nails. Lived through World War II driving a landing craft delivering Marines to the beach heads at some of the worst battles in the Pacific. He suffered no fools and he had this big deep voice that I think, was impossible for him to whisper, so anything he said, everybody heard it. LOL! He could be intimidating to say the least, but the best friend anyone could have. 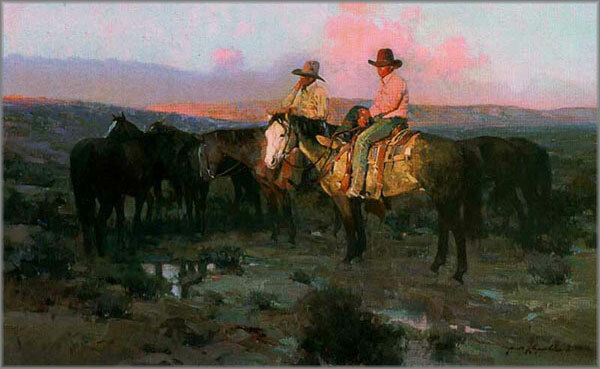 He is the only artist ever to send only one painting to The Prix de West Show at the National Cowboy Hall of Fame, and win the Prix de West medal (Best of Show), Gold Medal for Oils, The Fredric Remington Award,The Peoples Choice Award, and best display award from the Hall. That was all that was possible for him to win and he ran the table. 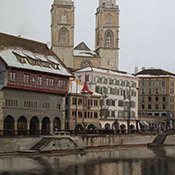 Here is the painting. Gary, you are so right! It is true in art and everything else, the saying I first heard in racing and that was, "The harder we worked, the luckier we got! "...John Mulligan 1966. And don't get me started on the attitude of so many people wanting instant gratification for free. It is not a pretty sight. Yes, thanks for sharing. It was a treat seeing your website and all your paintings. Fantastic! The cactus flower above is stunning. Very inspiring. Maria, this bio of mine was getting way to long, still is, but one of the things I want all to know is yes, I worked hard to learn about art. That being said, I would be less than truthful if I said I was totally self taught. I went over and I decided to do it myself by buying some books of famous American painters naturall ! Moreover, even if my English is not at the highest levels I started looking on ytube , I noticed Mark but I had been a little puzzled about his "carpentry's" lessons. It's been a while, and then I saw all his videos with attention and I decided to try. His approach "indirect" of "Alla prima " method and a pre-mixing of only 5 colors seemed to me the only logical choice to understand how to use colors and which are the right tones and values ​​to use. I have considered other possibilities and made ​​small tests, but the result was not satisfactory. I'm as stubborn as a mule I do not stop, if I'm really interested in something I go to the bottom I do the maximum and work hard! And now...here I am in this forum and for be here I had to overcome language's barriers but worth while, people are interesting there is a lot to learn all things that I can't find in my daily ordinary life! Wonderful reading your story John. Thanks for sharing. LOVE your work!!! What a story!!! Thanks for sharing! Welcome John....thanks for sharing your story and showing your beautiful artwork...love it! Just returned from 3 weeks in AZ over the holidays...have your ever participated in Prescott's outdoor events located in the downtown square...I think it would go over well....good friend Doug Milley shows his work there and does well! Liz, I think I said that in my comments of making a living as an artist and be successful with it without becoming a machine producing hundreds of "formula" paintings because people liked them. There are people who have made millions doing this, but I question how happy are they really as an artist or in their life. Contrary to the image and promotional info artists like Thomas Kinkade (RIP) who found a gimmick and road it into his grave. 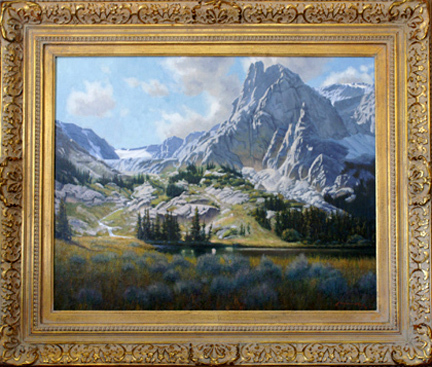 What is sad, to me is I was in the first three "Arts For The Parks" shows and so was Kinkade. This guy could really paint some fabulous landscapes and the looked nothing like the schlock he got rich on. Sorry, if I stepped on any toes, but that is what I and most of the gallery/museum art world thought of his gimmick art. The shows I was in with him were before he came up with what made him wealthy. He died at age 54or acute alcohol and Valium. It is not my intent to speak ill of him these are just the public record. My point is he did not sound like a happy camper. Painting what you love maybe slower, but personally, I prefer the peace of mind and enjoyment of what I do and the joy it brings to the people who like my work and those who purchase it. There is more than enough stress making a living as an artist without making it harder by producing the same old same old everyday that one probably comes to hate. Savannah, Thank you and you are welcome. I used to do the Phippen Show in Prescott in the late 1970's and up to 1982. It was a great show and sold well, but after a awhile it fell off and became an expense more than a earning event. The promoters, I think made two mistakes. even though I could be wrong, but the common belief among the artist showing when I did is pretty much consistent, and it is believed the Promoters were making money, but became complacent and when it began to drop off instead of a invitational show the basically opened it to any artist, crafts person and even "Sofa Sized Paintings" for $9.95 made in Taiwan salesmen. Most of us left. Later another group took over and cleaned it up, but kept potters, craft arts along with western art. It was called and advertised as a western art show, but it was really a mixed show a few levels above a traveling mall show. Most of us stayed away. Then the Phippen Museum took over and completely revamped it and from what I understand since they took over a number of years ago it has come back. Another problem was for awhile the county officials allowed all kinds of show promoters use the courthouse square as a venue for their shows. It seemed there was a show going on every month. That was also stopped and it helped the few shows they have now. Physically, I can't do these shows with the set up and packing and unpacking over a couple of days. My breathing and joints scream "No Way, Jose!" Consequently I don't do these type of shows and don't have the equipment to do it either. But they is one other thing and that is I have a gallery representing me here in Arizona (Biltmore Galleries) and in a sense I would be competing with myself and cutting the galleries commission out. Feels a bit unethical somehow to me. 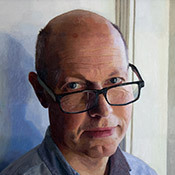 John I could say your paintings are wonderful, fantastic, great and all that and I would mean it. But the biggest compliment I could give to another artist would be to say that I would in a heartbeat if I lived by you take classes cause I think your works are pretty amazing! Now that painting you uploaded by Reynolds? Honest your work is just as superior. I had to look at it yours and his again. I can see why you win awards!